RDHA is a powerfully cleansing, light-fueled, Shamangelic Transformational modality that works on a core vibrational sub-atomic ‘DNA’ level. RDHA begins with an Auracle Color Therapy consultation. This is followed by the specific acupressure placement of special activation crystals and up to 22 Auracle Color Mist Sprays on the body’s meridian and chakra points. 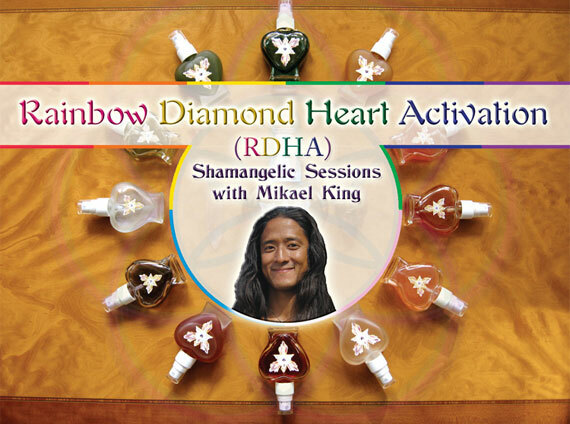 Circular double helix breath, vocal harmonics, acupressure points, sacred geometry, and uplifting essential oils may also be used in the RDHA Shamangelic Session. RDHA allows the client to relax in an empty but gently aware, void state. Once in this state, the transformation of dis-ease and illness begins through the re-alignment of the physical, sexual, emotional, mental, & psycho-spiritual aspects of being. At this time, any shadow issues or unresolved subconscious patterns hindering total whole body wellness (i.e. anger, resentment, depression, denial, deep fears, deep grief, shame, guilt, past traumas, abuse, childhood conditioning, ancestral bloodline conditioning, parental genetics, past life memory fields, negative belief systems, etc. ), naturally arise to the surface to be accepted, released, transmuted, and purified into unconditional love. • SURRENDER • CLARITY • SELF-REALIZATION • PEACE • PURITY • HARMONY • DIVINE GUIDANCE • LIGHTNESS • JOY • DEEP GRATITUDE FOR LIFE! • TOTAL RADIANT HEART HEALTH • PROSPEROUS WEALTH • GREATER SELF-WORTH • TRUTH SERVING LIFE PURPOSE • SACRED MASCULINE/FEMININE BALANCED UNIONSHIP • PASSIONATE GOLDEN OPPORTUNITIES ALIGNED WITH SELF-MASTERY PURPOSE. Private Intensive RDHA or BreathLight ‘One on One Sessions’ with Mikael: $6 per minute or $350 per hr. depending on client’s specific needs and what has to be addressed in a single and/or multiple RDHA sessions. Average Time of Session – 2-3 hr. * Kama’aina Discount for those on Kaua’i. Please inquire when booking. Mahalo!